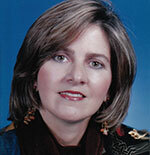 Patricia Cummins, ’79, was named Florida’s Elementary Art Educator of the year by the Florida Art Education Association. 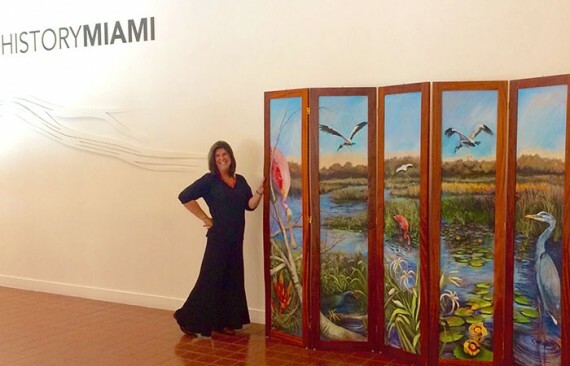 Here she is pictured with her oil on canvas painting, “Everglades Dream,” part of the permanent collection of the Tropical Audubon Society. College of Education alumnae took home three major awards issued recently by the Florida Art Education Association (FAEA). Patricia Cummins ’79 was named Elementary Art Educator of the Year; Lourdes Fuller ’98 was named Middle School Art Educator of the Year; and Beth Goldstein ’99 was named Florida Art Educator of the Year. Each year, FAEA recognizes members who have reached the highest level of professionalism and who have made significant achievements in the classroom, who conduct research or who have their work shown in exhibitions, to name a few. 2015 marks the second straight year FAEA recognized Goldstein for her efforts inside and outside the classroom. 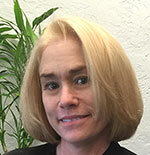 In 2014, she was named Outstanding Secondary Art Educator. One such contest where Cummins, Fuller and Goldstein encouraged their students to participate is The Fairchild Challenge; run by Fairchild Tropical Botanical Gardens, it is open to students from pre-kindergarten to high school and calls on them to create environmentally-themed projects. “I think that made an impact on my students,” said Cummins, who until last year taught children at Palmetto Elementary School in Pinecrest. “When they noticed that a corkystem passion flower vine at the school was damaged, they saw something happened to the butterflies – they weren’t there and they made that connection. Goldstein credits the Fairchild Challenge with motivating students where she used to teach at Miami Central High to excel. In a school where less than 12 percent of students were proficient in science at the time, she said, her students took third place overall in the science-based challenge. In all, the alumnae credit their time at FIU for helping them become successful art educators who can summon their creativity and connect with their students. Great article, I owe a lot to F.I.U.